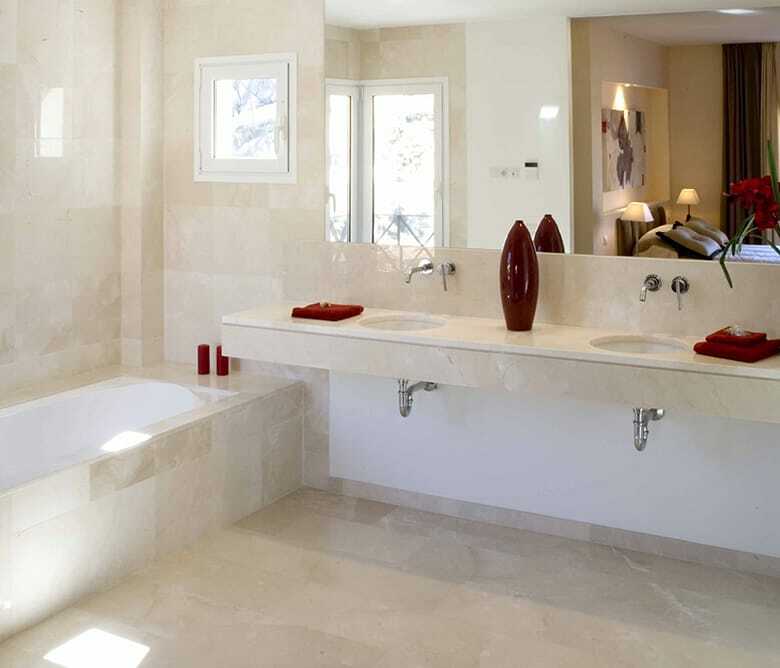 Customized marble bathroom countertops offer an advantage to interior design that few materials can provide. They offer the possibility to apply an infinity of tailor-made models, textures, and types of stone. Customized marble bathroom countertops combine beauty, functionality, and resistance, offering unlimited possibilities for interior design. All this makes it possible to affirm that there is a different marble worktop in every residence. 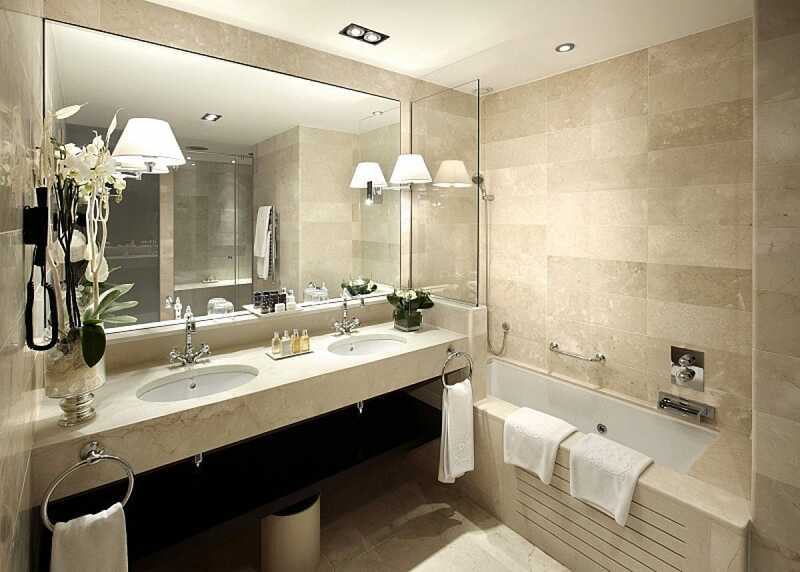 TINO Natural Stone has extensive experience in the elaboration of customized marble bathroom countertops. The final appearance of the piece is achieved thanks to two fundamental factors: the quality of the finishes and the techniques used, many of them handmade. Located on the Gran Vía de les Corts Catalanes in Barcelona, this centric building is one of the most exclusive hotels in the city. 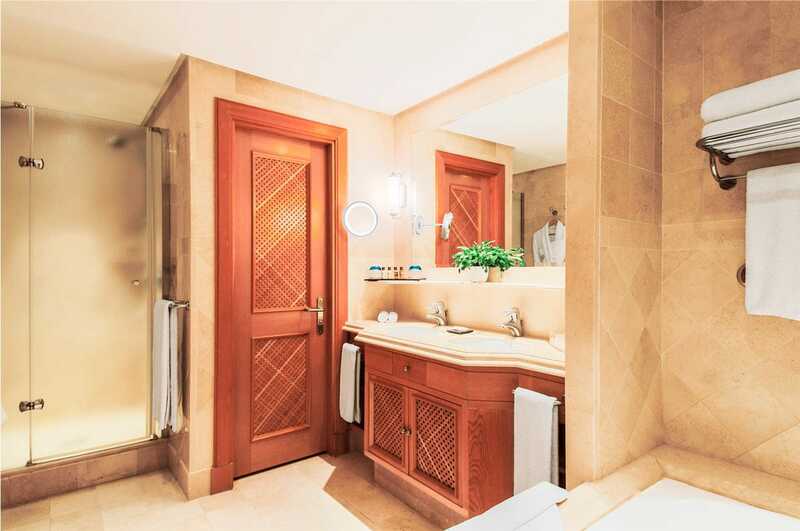 The Palace Barcelona chose the TINO Natural Stone team for the application of beige marble both for the countertops and for the rest of the coverings in the bathrooms. The design of this worktop is one of the most requested by customers. It has a gable attached to the worktop with an incised edge, with openings for the integration of the washbasins, in this case under the worktop, and a top that protects the mirror from the water splashes. 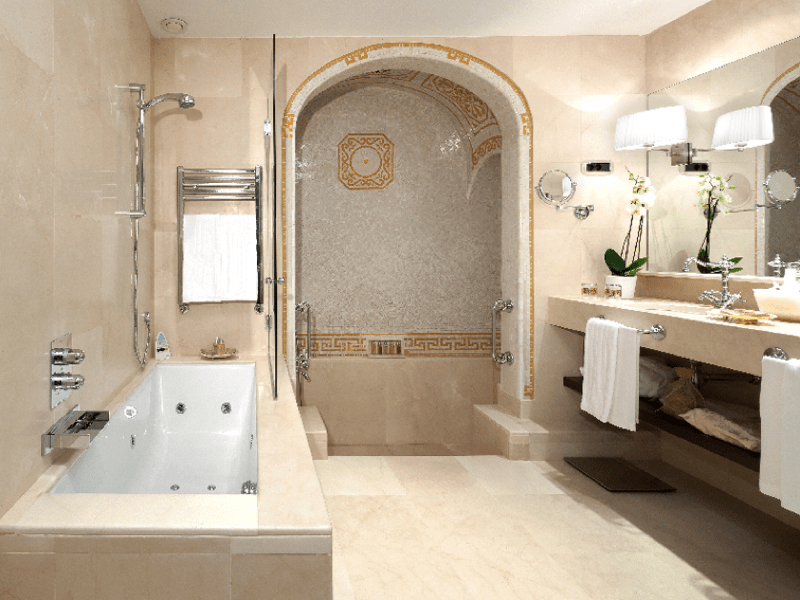 This other bathroom also belongs to the Palace Hotel Barcelona, where the subtle and warm cream of this natural stone contrasts with the richness of the mosaic of the vault later. We continue with the Crema Bianco, but this time we fly to the Sheraton Hotel Tenerife. In this case, we chose a honed finish that contrasts with the teka furniture and provides a colonial inspiration. The worktop consists of a lid resting directly on the wooden furniture. With an irregular design finished off by a molding edge that reminds us of the taste for stone craftsmanship. We jump from Tenerife to Fuerteventura to observe another colonial style decoration. The marble applied to the worktop is called Boticcino and has a soft beige base. Nuanced by light golden veins and a few particular white shades that suggest the movement of sea foam. In this piece, we have chosen a design with rounded edges that soften the foam forms. We leave the cream tones for the moment and travel to La Moraleja (Madrid) to corroborate the elegance and warmth of Kafe marble. The finish is Neo, and the designer has played with the contrasts using the white ceramics of the toilets, washbasin, and bathtub. A sober and elegant color as well as design of straight shapes which marks a style with a masculine touch was chosen. 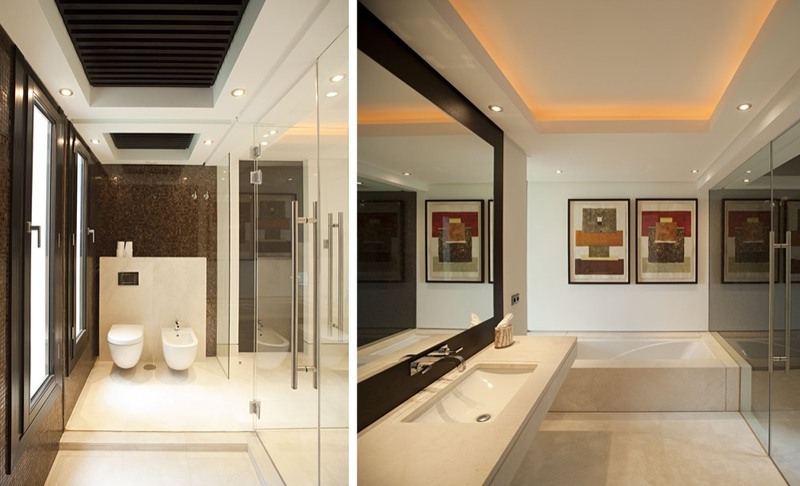 The serenity and wellbeing that this bathroom provides is no coincidence. 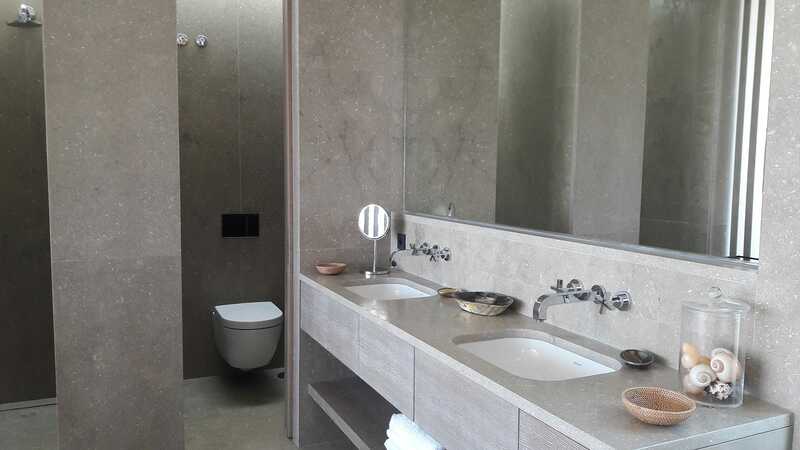 This is achieved through a total integration of the elements, opting for a countertop of straightforward design which does not intend to take prominence and the choice of a stone, the Grey Osiris, of warm and sober tones that create an enveloping space. 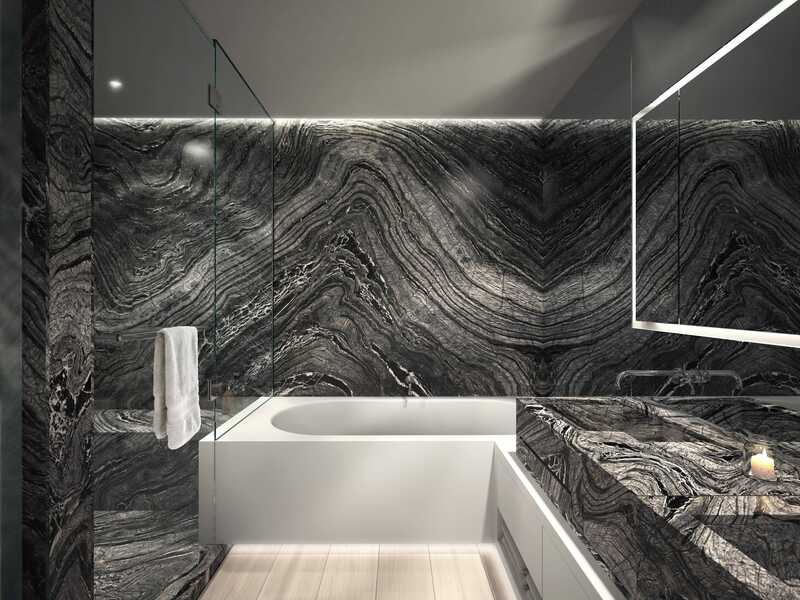 This striking design proposes the application of the wild Blue Violet black marble in walls and countertop. The capricious drawing that Nature has sculpted in this natural stone makes it capable of converting any space into a unique room. The shower area, surrounded by stone meanders, evokes the beautiful caves in front of the of some of the most beautiful coastal regions of the world. The washbasins, also made of stone, have been designed on this worktop. Highlight that in the walls as well as in the worktop itself, the continuity of the vein that creates a space full of rhythm and movement. The purity of lines and simplicity are the protagonists of this worktop made in Crema Bianco. The only concession that has been made in the design is the meeting of the gable with the worktop, highlighted by a subtle groove that creates a line of shadow — small details that make a difference. The worktop, perfectly integrated, contributes to the creation of a diaphanous space which is very pleasant and luminous. With the same criteria as in the previous case, the soft tonality of the Ivory Cream in matt finish and simple design based on functionality contribute to creating a space full of light and comfort. Black Dune is one of the most beautiful black marbles in the world. The white streaks create a line of equidistant linear shapes that furrow their black canvas with force, transporting us to the sensation of the freshness of the flow of the waterfalls. This worktop belongs to a luxury villa in Marbella in which TINO participated. 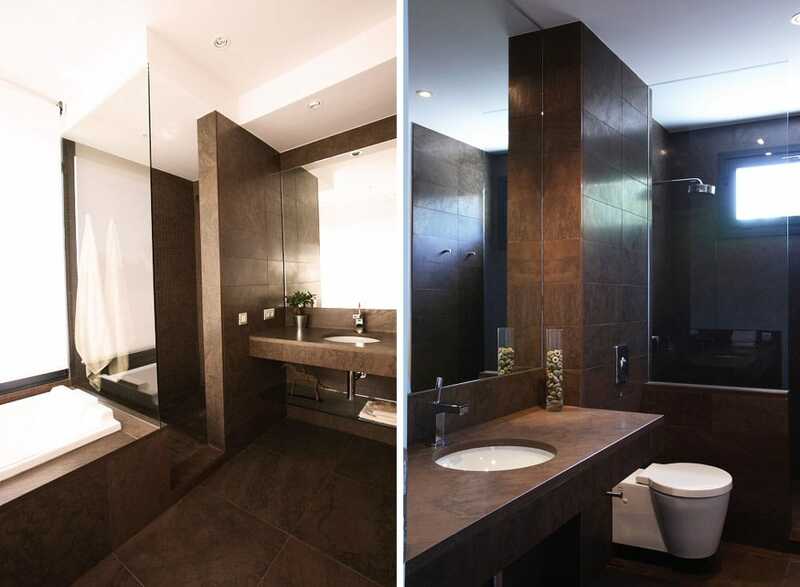 It was selected as the best natural stone for the different environments of the house. Here the design of the countertop seeks to give all the protagonism to the piece. A sculptural element in which the washbasin is integrated and the vein continuity enhances its beauty.